Everyone knows the famous speech President Franklin D. Roosevelt delivered to congress after the Japanese bombed Pearl Harbor: "Yestahday, Decembah seventh, nineteen fohty-one, a date which will live in infamy...!" 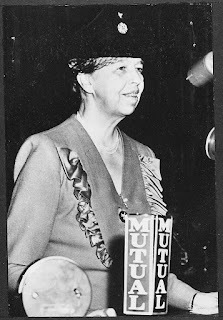 But did you know that first lady Eleanor Roosevelt also gave a stirring speech about the attack before his address, right on December 7th, just hours after the bombing? I didn't either.